How I removed my Gel Nails after 20+ years. Anyway for those of you that must remove your Gels at home and I know some of you are capable, I have seen your beautiful work online. Gel Nails that are properly done do not come off easy. Try not to pick them off. Most Gel soaks don't work. 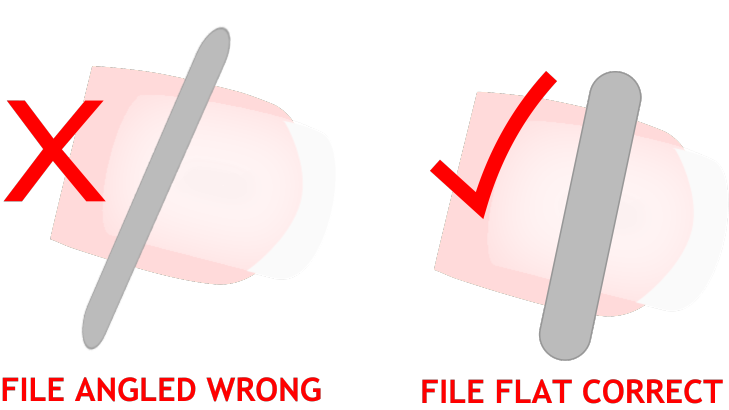 When filing you must hold your file flat and not at an angle so you don't file into your natural nail. (seen that too) and it's not pretty. Only file on the Gel and don't file on your natural nail. You should shape and shorten your nails before you begin. The first thing is prepare your work area and get your tools ready. Tools you will need: Two towels one to catch the dust and the other to lay your tools on, emery board, a large file 100/180 grit, nail brush, a three way buffer, cuticle oil, hand lotion, soap and water, a good nail strengthener or Gel Polish, polish remover and cotton. Towel to catch the dust under where you are filing. Do this until all or most of the Gel is gone. It's better to leave a few spots of Gel on the Nail than to file into your nail. Then do the same for the other nails. Now if your nails feel a little bumpy on top take the three way buffer and gently buff the tops of the nails using the medium grit side of the buffer. Make sure the tips of your nails are smooth and if needed us the soft side of the emery board to file and finish shaping your nails. If your Gel Nails were done correctly then your nails now should be close to the way they were before you ever had your Gel Nails applied. Brush off the remaining dust and wash your hands with soap and water. Dry your hands and apply your cuticle oil and lotion. Now take a tiny piece of the cotton with remover and wipe off any oil on your natural nail and try to avoid removing the oil from your cuticles. Use your Nail Treatment as recommended by the manufacturer. I always feel at least three coats if you are not doing polish over your treatment. Now that you have removed your Gel Nails you will need to faithfully use your Nail Strengthener for at least three months. That is about how long it will take for your nails to grow off the area that has had Gel over them. And remember to use your hands gently because the extra strength of the Gel Nails that you have been use to is no longer there and it will be a lot easier to break your natural nail. Confession ;-) : Because I am really hard on my nails and did not want to commit to doing a nail treatment. I went from wearing Gel Nails to wearing a Base Coat and Top Coat of Shellac until I felt my nails were ready to be natural again. Now my nails are all natural in great shape and I am always having to shorten them. Yeah! Good Luck to You on Removing Your Gel Nails! Leave me a message tell me how your nails are doing after you remove your gel. Adding a nail strengthener would probably be a better choice it will catch the new growth at the back (the cuticle area) as your nails grow out and will help to strengthen the new nail as it is growing out. Having your nails shortened for awhile will also help until all your nail is replaced which takes about three months. I know when I took my gel off it took me awhile to adjust to not having that extra strength on my nails. Thank u yes that helps and yes it is gel polish. So really the gel polish isn't so great for my nails either? ? As long as you or your nail tech are using a good professional product, applying and removing it as recommended you should be fine, because your nail is continually growing off (being replaced with new nail). I had gel on my nails for 20+ yrs and I used the gel polish to make my transition, It really worked well for me. If I wanted to have color on my nails now I would probably do one of the gel polishes because it last so much longer than regular polish. Thanx so much I actually have some solar oil! Yeah! ;) The Solar oil really is a good one and very important if you are going to do the Gel Polishes. Hi I'm looking to get rid of my permanent uv french too and was wondering what do I tell the nail tech? That I want to file these down and switch to regular gel? When you say regular gel do you mean the soak off gel? Do they do that as french too? Hi Alexis, Thanks for your questions about your gel nails. I am not sure what you have on your nails but regular gel would be a thicker gel applied for strength to your nails and you would be getting what is called a fill in every two or three weeks where your nail tech would file the gel down and fill in the regrowth at the back and curing with a UV light. Do you know the name of what you have on your nails now? The nail tech that applied your gel should know the best removal process for the product you have on your nails. It's sort of confusing because we have so many products with the gel name attached to it, for instance the gel polish that you see where they remove it by wrapping with foil this is not gel nails it is gel polish. ( no filling or fill ins ) and yes it can be done as french. Are you wanting your nails to be natural so you can have regular manicures and wear regular nail polish and or the gel polish? Yes I have the gel that requires a fill in every 2-3 weeks. It's the CND Brisa Sculpting Gel. Since I've had them so long I'm nervous about how they will look once filed down and want to make sure I know what options I have to paint over the thin layer of gel that will be left. The nail salons in my area are primarily Korean owned so there is a language barrier. I want to make sure I know exactly what to tell them that I want. Thanks this extra info really helps :)What I did was shortened my nails to a length I felt would survive the transition (10 shorter nails are prettier than 7 long ones) ;) I am very hard on my nails and had been dependent on the strength of the gel for many years,so I left a thin layer of the gel and then used the CND Shellac (which is called gel polish) over the gel that was left on the nails. I did the gel polish for about three months which is about how long it takes for the nails to grow off and at this point your nails should be like they were before you ever had the gel put on. Just remember if you are going back to regular manicures with regular polish your polish may not last long. Another thing you will probably need to do is keep a fine grit emery board with you because you may get little rough edges that you will need to smooth until you get use to the change, this will also help from the nails catching on things. The language barrier can be a problem but if you can get them to understand that you would like to leave a thin layer of gel on the nail and use s gel polish for awhile it will really help with your transition. I just wanted to ad that you can do the gel polish with french or color if you like.